Take light colored yarn for the muzzle. Tie a chain of 4 VP (air loops); Starting from the second loop from the crochet hook, knit 2 SBNs (single crochet) into each loop. In the next loop, knit 3 scs. Turn to the other side to knit in a circle, and knit 1 sc and 2 sc in the next two loops, respectively. It turned out 8 sc. 2nd circle: in the next loop, knit 2 scions, then - 1 scons in one loop; in the next three loops - 2 sc; next one again 1 sc and in the last two loops in this circle knit 2 sc each. It turned out 14 sc. Tie another 7 sc (half circle) - one in each loop. The muzzle is ready. As soon as the head is ready, we will sew a muzzle to it. Make 2 VP and knit 6 hooks into the second loop from the hook. 2nd circle: in each second loop, knit two STBs - 9 sc. 3rd circle: knit one sc in each loop - 9 sc. The eyelet is ready. Leave the "tail" to sew the ears to the head. Tie the second in the same way. Head and body knit base color. Begin to knit from above, from the crown. 2nd circle: knit two STBs in each loop - 12 sc. 3rd circle: in each second loop, tie two sc (in the other, respectively, one sc) - 18 sc. 4th circle: knit 2 scons in each third loop (in the other, respectively, also one sc) - 24 scons. 5th round: in every fourth loop, knit 2 sc - 30 sc. 6th and 7th circles knit one sc in each loop - 30 sc. 8th round: each fourth of the sc knit in two loops - 24 sc. 9th circle: each third sc knit in two loops - 18 sc. Round 10: each second sc knit in two loops - 12 sc. The head is ready. Do not cut the thread - the body will start to knit from the same place. Sew a muzzle (you can fill it a little). Tighten your head tightly and continue knitting. Continue to knit from the same place where you stopped to knit the head. 1st round: each third sc knit in two loops - 9 sc. 2nd circle: knit one sc in each loop - 9 sc. 3rd circle: knit 2 sc-12 sc in each third loop. 4th circle: knit one sc in each loop - 12 sc. 5th circle: knit 2 sc - 18 sc in each second loop. 6th circle: knit one sc in each loop - 18 sc. 7th circle: in every third loop, knit 2 sc - 24 sc. Round 8: knit one sc in each loop - 24 sc. 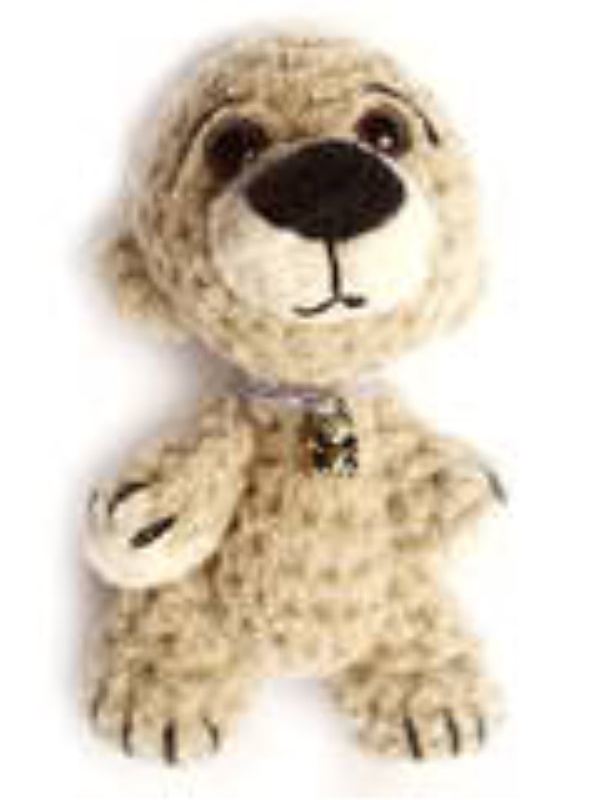 Stuff the bear's body tightly and finish knitting, knitting to the end of each sc in two loops. Take a light colored yarn and knit a chain of 4 VP; Starting from the second loop from the hook, knit 2 sc in each loop. In the next loop, knit 3 scs. Flip to the other side to knit in a circle and knit 1 sc and 2 sc in the next two loops, respectively. It turned out 8 sc. Next, continue to knit the main color. 3rd and 4th circles: knit one sc in each - in 14 sc. 5th circle: knit 3 scions; 4 following scons knit in two loops; 3 sc It turned out 10 sc. 6th circle: knit one RLS - 10 RLS. 7th circle: knit 3 scions; 2 following scons knit in two loops; 3 sc It turned out 8 sc. Round 8: knit one sc - 8 sc. Stuff the leg with filler and finish knitting, knitting over the sc in two loops to the end. Leg ready. Tie the second by analogy. Take a light-colored yarn, make 2 VP and knit 6 hooks into the second loop from the hook. 5th round: each second sc knit in two loops - 6 sc. 5th and 6th circles knit one sc in each loop - 6 sc. Fill the handle with a filler and finish knitting, knitting along the RLS in two loops to the end. The pen is ready. Tie the second by analogy. Bear is almost ready, it remains only to collect. Sew legs and arms to the body. Sew the eyes and shape the face, and then sew the ears. You can attach the arms and legs with the help of thread hinges - then the bear will be able to stand and sit, and its arms and legs will move.